Shows over and it’s time to go home. 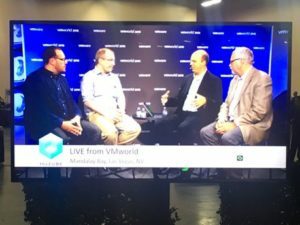 VMworld 2016, I believe, was a huge success for INFINIDAT and for VMware as well. Here is a quick wrap-up of the show from our perspective. Again, we opened the show this morning with a Facebook Live stream that can be found here and we talked about what has gone on for the past couple of days. We have done these live streams each morning and re-posted them so if you would like to watch them, you can replay them on the INFINIDAT Facebook page. When you get to the page you can scroll down and see all of them. The show started to wind down today, however we did have another 350+ people attend our booth bringing our total to over 1,450 badges scanned. While badge scans are not the main metric, it does help us in getting our name and our brand out. The @INFINIDAT team did almost 1000 demonstrations to prospects showing them features of the #InfiniBox. We had over 20 live presentations in the booth from customers, partners and our own technologists. We had 2 live sessions on the #Cube; one provided a company overview and update and one with our customer DSW. We briefed more than 25 analysts. On Tuesday, we held a customer appreciation dinner at Zeffirinos. We had 1,000s of impressions on social media. We captured over 22 hours of video that you will be able to see in a VMworld 2016 playlist on our YouTube Channel and we took 100s pictures. In addition one of the most impressive takeaways I had was the reaction to our “Faster Than Flash” message. Many prospects that heard exactly how we are faster than flash were extremely impressed. It is a true testament to our architecture as to how, for real world workloads, we are able to perform faster than all flash arrays. People now understand how we can have such great performance. As you add in 99.99999% reliability and prospects were very impressed. One of the interesting things this year was the lack of automobile giveaways. There was only one this year. Last year there were 5. We had a number of people stop by the booth that wanted to talk about how they could take advantage of InfiniBox for the cloud. There were two types of customers, businesses that wanted to build a private cloud. The second type were service providers that wanted to know how we could help them with storage for their solution. The number one thing they loved the most was our flexible pricing model that supports capacity on demand. We can put a full system on the datacenter floor and only charge for what you use. When you start to consume more capacity, only then do we charge you. However because you have the whole system, when you need to more capacity, you just access it, no service call, no need to have an engineer come in and add the capacity. You have it from day one and you pay for the extra capacity as customer start to consume it. A lot of the vendors on the show floor were also talking about the analytics that their solutions provide to the user to make better decisions on how to better take advantage of the technology and how it can help them, drive better business value. People really want to know how the technology they buy can help them make their business better. They don’t have the cycles or resources to manage it, but they want to know what it can do for them. We would like to extend a HUGE thank you to all of you that stopped by the booth and asked some really great questions and participated in some very valuable conversations. In addition, this event couldn’t have been what it was without the help of our customers, DSW, Bluelock, our friends from the large insurance company and our partners, APTARE, Brocade, Intel and Stratoscale. We want to also thank ALL the INFINIDAT employees who had a hand in helping us create this event. It took most all of us working for the last six months to pull all of this together. Our next stop is VMworld Barcelona. We are looking forward to seeing everyone there.